My beautiful new cabinets are installed and the room is looking good! Builder Bob does such wonderful work and seems to come up with great ideas all the time. You are looking at 108 inches of cabinets on the bottom and also on the top. The bottom has 3 cabinets with one shelf in each and then there are also 3 pull out file cabinets. I am using one for files, one for batting scraps and one for muslin scraps. The outlet on that wall was behind the cabinets so Builder Bob put one outlet above the counter and one high up above the top shelves so my new daylight florescent lights could be plugged in and I can use the wall switch to turn them on. Don’t worry, he really knows his electrical stuff. We really had some fun working in the room. We were going to put up 2 florescent lights over the counters and one over my sewing machine. Well Builder Bob put up another high outlet and the hooks before we realized you wouldn’t be able to open the cabinet doors (there is a slanted ceiling). We then hung the light over my machine and it wasn’t straight at all which he couldn’t figure out…..I think we were getting tired because the sewing machine wasn’t lined up straight which was the problem. I had fun last night hanging up templates all over the place….hmmm looks like I have quite a few. He put another light switch on this wall so I can turn on/off this light and receptacle at the same time so I don’t have to worry about forgetting to turn off my iron. I can’t believe the difference the light makes! I was sewing today and had no problem seeing, usually I have 2 floor lamps and still have a hard time. I am really liking this and don’t even have the lamp in the back turned on! We still have several cabinets that haven’t been used so Builder Bob wants to build a frame around my Singer sewing machine with the 18 inch cabinets. Right now my machine is on 1.5 inch blocks to see what would be a good height. I tried 3 inch blocks but it was too high. When he is done I’ll be able to move it around as one unit. I’ll keep you posted on this project. I have this wall looking pretty good now. Since I eliminated the white bookcases I had to move my books and magazines over here. I think I have a serious quilt book addiction. So today I got to do some sewing! If you notice my cutting pad sticks out past the counter top that is because the counter top is only 22 inches deep and my cutting board is 24 inches. I have a small ironing pad and Builder Bob made me a board that is 3 times that size but I don’t think I will use it for now. The closet has to be emptied…….more on that later and there is the sewing machine that started all of the remodel. I have a quilting frame for it but don’t worry – phase 2 of my quilt studio remodel is coming soon! Look at that! I even have room to bring my laptop in…….although I don’t know if that is good or bad for sewing. If you look closely you can see Builder Bob taking a break at his computer playing his favorite game Luxor. I am so lucky to have such a great guy! Wow! It's looking good. I can't wait to see more! Thanks Builder Bob, for making our Connie so happy! Connie what a great job of the cabinets and studio. Builder Bob does excellent work.How exciting for you.I think I will send my Builder Ray over to your Builder Bob for some ideas. Wow I love it. You have thought of everything and then some. Builder Bob, is he for rent! Just kidding. Thanks for the peek inside your sewing room. It is fabulous. Your Builder Bob has done you proud. The room is taking on such a nice cozy feel. I think I would have a hard time making myself leave it. Enjoy! I only have one word to say about your new sewing area, JEALOUS! LOL's. Congrats! What an awesome space to sew and create! You have got to be THRILLED with all of this! How do you decide what goes where??? I'd be spinning in circles, flapping my arms….. It's wonderful! it is coming along quite nicely!! See for me the laptop would be a bonus! I love to have my Netflix (normally Law and Order) in the background as I stitch just to keep me company!! I am envious of your sewing room 🙂 you are so very lucky!can't wait to see all the amazing projects that are going to come out of the new room! Wow!! those cabinets are really coming together Kiera….very nice job done. I love your space…. OMG… I want a Builder Bob too!! What a great space you and Builder Bob have created Connie…look forward to the next Phase and all the fun projects you will create in there!!! Ditto to all the above comments. We're moving house next year so I have big plans for a wonderful sewing space, too. You and Builder Bog going to be in Omaha anytime next year? You and Builder Bob have just won an all expense paid trip to Ohio! JK! What a fabulous sewing space! I need a big light like that. That is a great re-use of the cabinets. What great storage space! You are lucky to have Builder Bob, but then it sounds like he's lucky to have you too to work with him on some of the jobs. Your sewing room is fantastic. Builder Bob has done a wonderful job. Thanks for sharing! 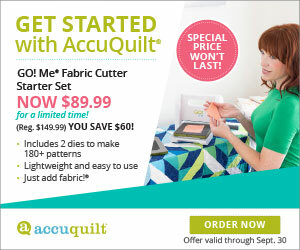 I think we get great ideas for our own work spaces by viewing other quilter's studios. I like your cabinets – keeps the room looking tidy and everything is still close by. You'll love having your rulers so close to the cutting mat. More kudos for Builder Bob! Kudos to Builder Bob! Your studio looks great – can't wait for Phase 2!! You both did a fantastic job on your sewing room – it looks great! How exciting!! Oh My Goodness!!!!! I am so impressed – give that man a big hug!!!!! He has done a wonderful job – Love all those templates on the wall too – we will be expecting big things from you now – no excuses at all! It looks like a really nice setup! What's in those little slots underneath the cabinets? They almost look like cookie sheets/jelly roll pans. You're a lucky girl! You have a dream room, and I'm sure the cabinets will be overflowing soon with new quilting supplies! I know what you mean about quilt books…I have dozens of hardcover books that I don't use anymore, can't part with, and they take space away from fabric storage…what to do?